Quick tips on writing and speaking, and how to know when to use what. Whoever vs. whomever isn’t commonly used, but every now and then it comes up. Just this past week I had a lovely coworker ask me this rule. It takes a little thinking, but if you can remember him and he, you can remember which one to use. Pick him. He volunteered first. We will visit [whoever/whomever] you recommend. We will visit him. You recommend him. I know it feels a little weird, but never fear! There’s a great quiz, so you can practice as much as you like. Of course, you can always cheat and just reword the sentence – which I also suggested to my coworker. Please let me know [whoever/whomever] is the correct source to contact for the article. To avoid usage: Please give me the most appropriate contact for the article. Who should I contact for the story? No matter what you choose and as long as its correct, your readers will appreciate the accuracy. And if you’re ever in doubt, look it up or ask someone. It only takes a minute. Happy writing, everyone! How are you? I usually answer one of two ways: I’m good or I’m doing well. Many people teach that either is acceptable when asked how you are, but I disagree. The more we blur the lines between the rules, the more exceptions are made, and the more confusing the language becomes. But how do you know which one to use and why? The rules are pretty basic, but I find ‘well’ too formal in casual conversations with those I’m close to. In professional settings, I use ‘well’ and always use them correctly and know the difference. 1. Good describes people, places, things, ideas. — That was a good show. — We ate some good Chinese food. 2. Well works as a state of being. It doesn’t have relate to just humans either. It can be a project, a work day, etc. — I’m well. I’m doing well. — The project is going well. The best way to learn how to use these correctly is to do so. The more you practice and break bad habits, the more natural it becomes. Try this quick test to practice, and if you have any other tips, feel free to share! My favorite thing about this rule is that it’s based on sound, not the written letters/word. If you’re confused about this rule, say the phrase aloud and you’ll usually hear which word (article) is correct. An – Use an if the noun following makes a vowel sound. As you can see with honor, the h is there, but it is silent. If you say honor, you’ll hear the aw sound, which sounds like a vowel. A – Use a if the noun following makes a consonant sound. The exception (because there’s always an exception): the long u (pronounced yoo) sound. The best test is to think it aloud, so you hear the sound the noun makes. It’s all based on phonetics, and you’ll know whether it sounds and feels right or wrong. For fun, say the following aloud and you’ll hear how wrong these sound and feel: an phone, an ladder, a ant, a ending. If you have any tips or questions, feel free to comment below! Grammar geeks all over the world will battle this issue until the end of time. It’s almost as controversial as abortion, health care, and gay rights. The debate: the serial comma (aka the Oxford comma) and its relevancy. This is a comma usually used before the word ‘and’ in a series. Ie: For dinner, we had mashed potatoes, fried chicken, green beans, and rolls. In school, we were taught to always use that comma. No exceptions. However, when I worked on my college newspaper, I learned that Associate Press says to remove it. What?! It felt like my world turned upside down. Should You Use the Oxford Comma? It depends. If you’re writing a college paper, probably. Although, I’ve heard some professors don’t care. If you work for a magazine or newspaper, probably not. If you’re writing for your blog, decide and be consistent. 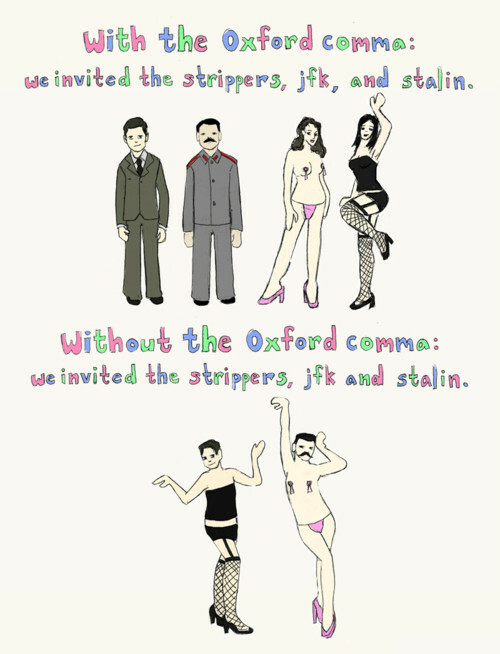 I don’t argue usage often because, much like religion, the decision to use the Oxford comma is a personal one. My rational is I can list more reasons to use it instead of not using it. It does clarify meaning, it does help the reader pause, and it separates items in a series. Saving space is not enough of a reason to not use it. And even though my job requires me to remove it and follow AP style, I do use it if there is more than one ‘and’ in a sentence because AP doesn’t address that instance. Ie: On our vacation, we hiked and biked though the mountains, ate seafood, and went to an amusement park. Therefore, I recommend using it unless otherwise told. I don’t think the Oxford comma will ever disappear, especially with more than 30,000 Facebook fans and possibly millions of hard-core grammarians supporting its usage. What are your thoughts? Are you pro or anti Oxford comma? Tell us why in the comments section! Guess what? You just made a BIG mistake. I mark up premier vs. premiere all the time. Most times, the error is in ads in this exact usage. They are the premiere hotel, destination, B&B, etc. Unless they are a movie or play, they’re not the premiere anything. I’ve noticed people use an e on the end because they think it looks better, or maybe they are misinformed and think it’s the British or French spelling. The e on the end does not make something look more important – in fact, it may make you look dumb. It’s not a style thing or preference; they are two different words with two different meanings. Premier (no e on the end): This is an adjective that describes something first in rank or importance, or first in time. a. Some say the Music City Center is the premier place for meetings and events. b. The premier hot spa draws in more than a million people annually. Premiere (with an e on the end): This can be a noun or a verb, and is the first public viewing of something. Think of a debut of a movie or play. a. The movie premieres next weekend. b. We’re going to the after party once the premiere is done. One way you can remember this is: movie ends in e, and its premiere ends in e, so there’s your correct usage. Otherwise, you probably need to use premier. For more tips, check out our Grammar and Punctuation tricks! One night, a friend of mine called and asked me what the difference was between since and because. I hesitated for a second and reached for my laptop – I knew how to use them but not the hard rule. He asked after a professor marked up a paper I proofread earlier that week. Oops! It never occurred to me there was a real difference, especially when we use them correctly without realizing it. Some hard-core grammarians would object, but because and since can almost be used interchangeably. Even Webster’s shows the word SINCE after the definition of because. Since: Think of time. If you’re talking about the past, use since. T also comes after S in the alphabet, so think: since time. a. They moved to Nashville since the hurricane hit Florida. b. Since we were kids, we have gotten into trouble together. c. I’ve wanted to talk to you since yesterday. Because: Think of reason. Something happened because of something else (cause and effect). a. We went to the store because we were out of milk. b. I have to finish the project because I am going on vacation.